As I mentioned in my previous blog, I am focusing on creating quilts in the 2.5 square feet size or smaller for the fall, both to replenish my stock of smaller quilts and because past sales in the fall indicate small quilts are popular this time of year. 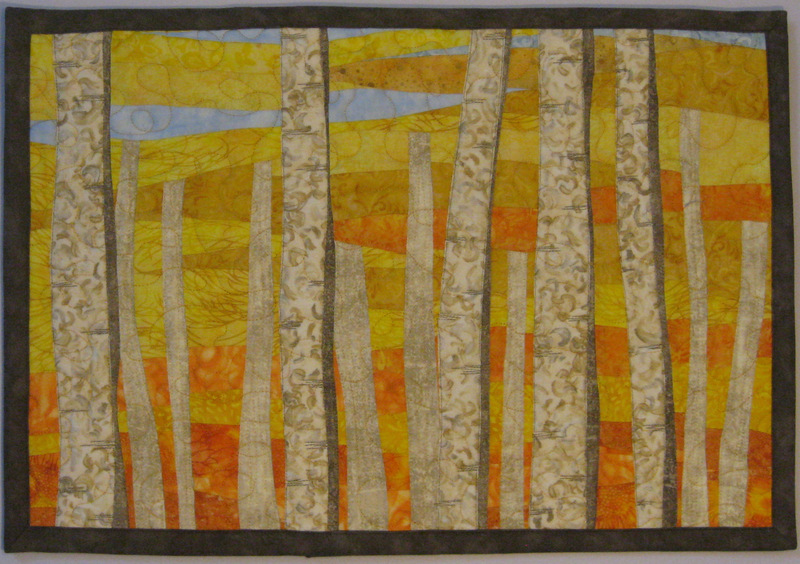 Creating landscape quilts of sunsets, sunrises, pastoral scenes, woods and my newer birch trees are an important part of my art quilt collection. My creative process isn’t so refined that I can predict the size of the final quilt so trying to make smaller landscape quilts is a challenge. I start by doing more sketching, and for me this is usually very sketchy as I’m not good at drawing!! 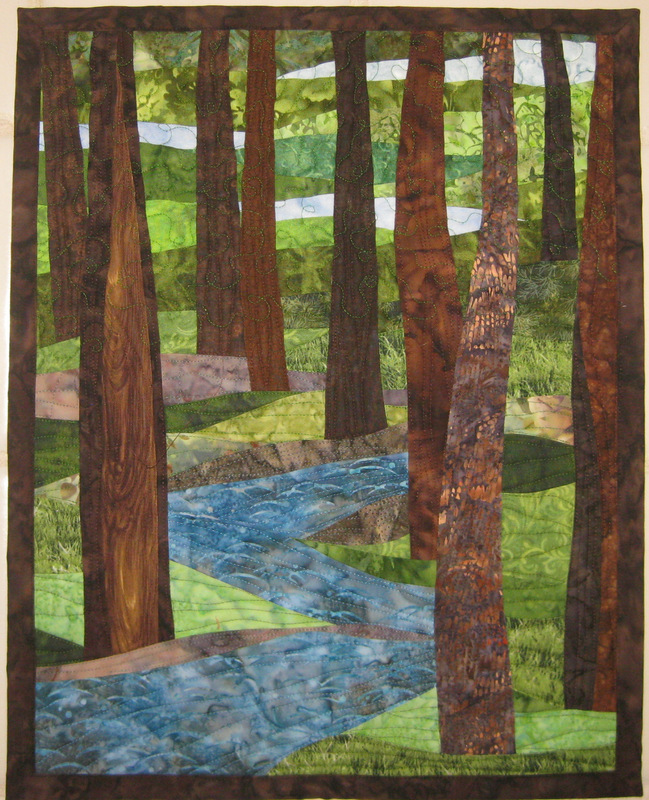 If I have an end product goal of 15″H x 22″W I have to scale the sections of the quilt. 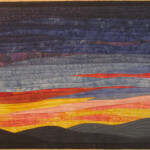 For example, a sunset often has several components: the horizon, the dramatic yellow/pink part near the horizon, and the upper sky. Once I know how many inches in height I am targeting for each section, I can begin to create the art quilt, section by section. When I am working towards a specific size of quilt I usually make the sections separately and then put them together, once I know the proportions are correct. If I’m just creating with no concern for size, I often work from the sunset near the horizon up an d add the horizon at the end because I can add more sky if needed for the end size. Making small tree art quilts involves similar planning so the stream is appropriately downsized and the trees are proportional to the final size I’m working towards. 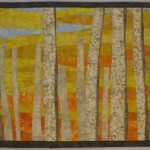 I’ve included pictures of some of the small landscape quilts I’ve just completed. 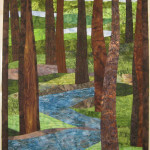 The Trees with Stream quilt already sold! How do you construct your “wonky” curved lines for your sky? I am making a queen size quilt for my adult daughter, who wants an ocean theme, with undulating strips for the ocean. Nothing straight or regular for her! What is your best advice on the easiest way to create undulating strip pieces? First, sorry to be so slow at responding. I’m just figuring out where comments appear in my background site management. I make the curved piecing by using a wallpaper cut. You take two fabric pieces with right sides up and lay about 2″ overlap, one on top of the other. Then you cut your curve. Finally, you sew with right sides together, slowly. 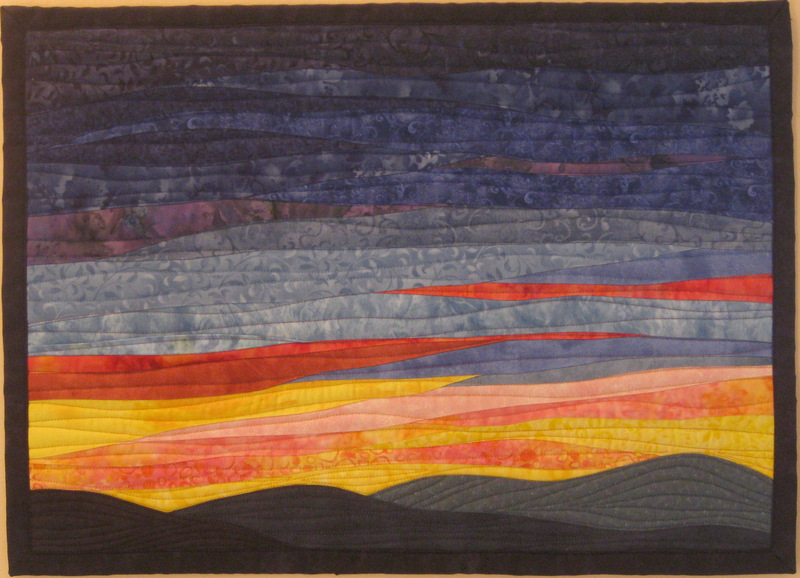 When making my sunsets, I often cut the curve of the piece most recently attached to the quilt and then lay that cut edge on top,of the next piece and cut it to match the curve. I have a blog post about piecing curves so look back thru. Good luck!